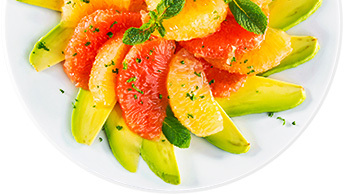 1 Cut the avocado and grapefruit and mix together so the avocado doesn’t turn brown. 2 Toss with the vinegar, Omega-3 Liquid and spices. 1 Prepare the dressing by adding the ingredients to a food processor and blending until smooth. Add water as needed to thin until desired consistency is reached. 2 Next, rinse the cooked quinoa and transfer to a large bowl. Use paper towels to remove any excess water. 3 Then add the cabbage, cilantro, chopped almonds, and green onion to the bowl along with the dressing and toss together until coated. 1 Place lentils and water in medium pot on high heat. Bring to a boil. Once boiling, reduce heat to low and simmer uncovered for about 30 minutes or until lentils are cooked through. 2 Place chopped sweet potatoes on a lined baking sheet. Drizzle with extra virgin olive oil and toss to combine. Roast for 20-30 minutes or until tender. 3 Whisk together the dressing ingredients in a bowl. 4 In a large bowl, combine lentils, sweet potatoes, cilantro, kale, red onion, and toss with dressing. Combine all ingredients in a blender and blend until smooth or your preference.